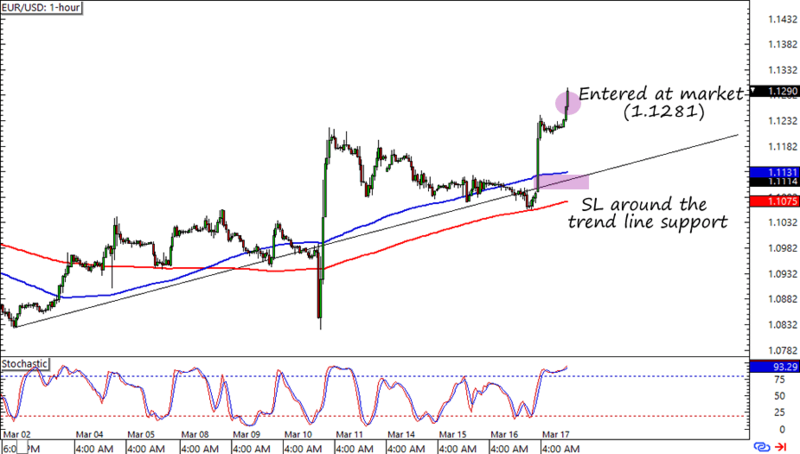 Forex Trade Setup: Riding EUR/USD’s Uptrend! I’m in! Since EUR/USD didn’t make any deep retracements after the FOMC event, I decided to ride the pair’s forex uptrend as soon as it made new monthly highs. A couple of days ago I pointed out in my watchlist that EUR/USD is in a sweet spot for a long trade. Unfortunately, the FOMC statement was looming over the trade at the time. But now that the verdict is out, I have decided to jump in on EUR/USD’s uptrend. Yesterday the dollar bears partied in the pip streets after the FOMC statement came out. Not only did the Fed lower its growth and inflation forecasts, but it also looks like the members are now expecting fewer rate hikes throughout the year than they did back in December. Meanwhile, not even throwing the kitchen sink at the euro zone’s problems was enough to rain on the euro’s parade. Heck, the common currency even RALLIED after the ECB implemented a more aggressive stimulus program! On the technical front I was waiting for a retracement after the FOMC event boosted EUR/USD like there was no tomorrow. But a retracement was not to be, so I decided to enter at an upside breakout instead. I entered at market (1.1281) after it blasted above its top weekly ATR (1.1245) and placed my stop loss juuuuust below the 100 SMA and rising trend line support. I only risked 0.25% of my account with plans on adding to my trade on a retracement or a new high. I don’t have a specific profit target yet but the 1.1500 handle is looking pretty good. Bought 0.25% worth of my account at market (1.1281) with my stop at 1.1125. Initial profit target is at 1.1500 but I’m willing to adjust depending on the pair’s volatility. Add another 0.25% on a good retracement.